This post explores how the epoxy-amine stoichiometry can affect the cure path of autocatalytic cure reactions, providing additional insight into the behavior of epoxy-amine thermosets. We illustrate some interesting benefits as well as precautions of altering the stoichiometry. For a variety of reasons it is not uncommon for systems to be either amine-rich or epoxy-rich. For example an excess of amine will help ensure that there is no unreacted epoxy that can react with itself at elevated temperatures. We start with Eq. 2 in Part 10 of this series, an equation based on the chemistry of the amine-epoxy cure reaction, and generate conversion-time and rate of conversion-time data with selected parameter values. In all examples in this post we keep k1 constant at a value of 0.0001 sec-1 and k2 constant at a value of 0.01 sec-1, the values yielding the Small catalyst level curves in the previous post, and examine different stoichiometric levels, both excess amine and excess epoxy, vis-à-vis 1:1 or balanced stoichiometry. Utilizing the methodologies described in Part 11 of this series we generated αEp and dαEp/dt vs. time data from Eq. 1 which are plotted in the figures below. αAm and dαAm/dt were computed from the following relationship between αEp and αAm. Ep and Am stand for epoxide and amine, respectively. Figure 1 illustrates the expected behavior for an amine-rich system. The epoxide conversion is complete, ie αEp = 1, at about 30 minutes. At the same time the amine conversion reaches its ultimate conversion of αEp /B = 1/1.3 = 0.77. 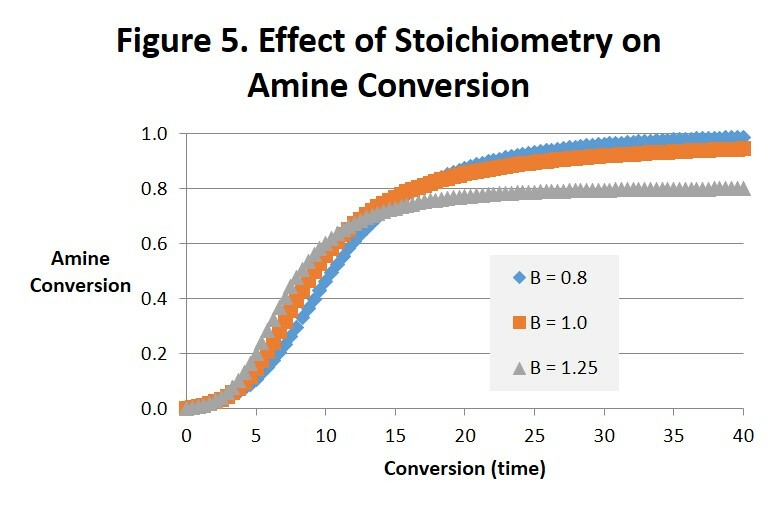 Figures 2 and 3 illustrate how increasing the amine concentration in amine-rich systems accelerates the cure reaction and helps drive the epoxide reaction to completion in much shorter times compared with a balanced 1:1 stoichiometry. While the benefits in accelerating the cure process seem obvious other properties will change in ways that may or may not be beneficial and need to be considered. For example, Tg and modulus will be lower and the surface chemistry and reactivity will be altered. Both the time to gel and the conversion at the gel point will also be affected . Notice in Fig. 3 how the maximum reaction rate, and as a consequence the maximum rate of heat release, appears to increase as the stoichiometry becomes less balanced. Because there is less material to react the size of the exotherm in Joules/gram will be less but it may be more intense. Also notice that the autocatalytic nature of the reaction is not altered. We pointed out in the last post that Eq. 3 below leads to dα/dt = k1 at t = 0 where a = 0. But it can be seen from Eq. 1 that dα/dt is actually equal to Bk1, as can be observed by close inspection of Fig. 3, and therefore only equal to 1 when B = 1. Figures 4 and 5 are interesting to compare with each other. 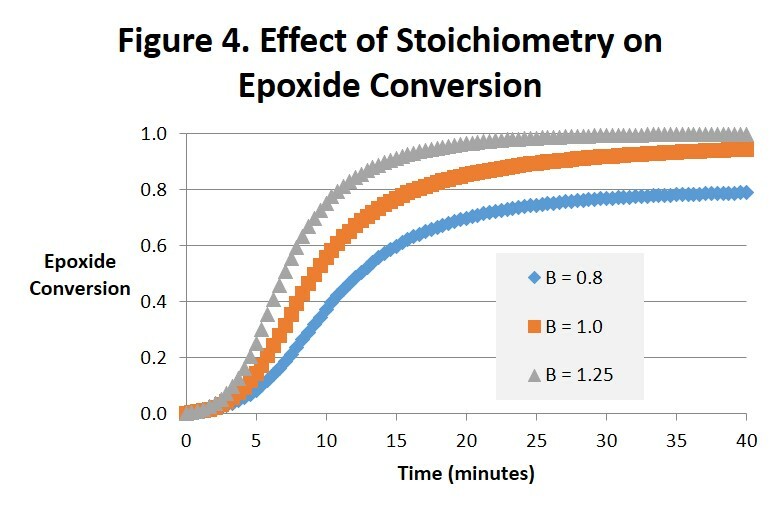 Figure 4 projects the epoxide conversion vs. time and Fig. 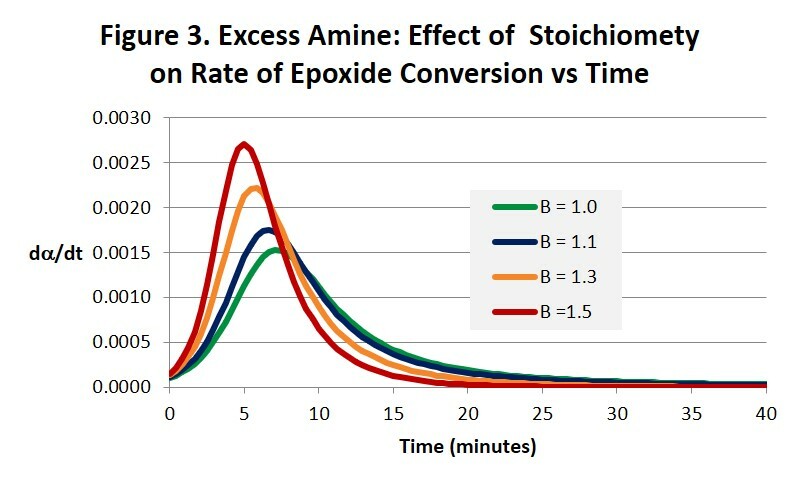 5 amine conversion vs. time at 1:1 stoichiometry, 25% excess amine and 25% excess epoxide. The effects on epoxide conversion are more dramatic and straightforward. Note in Fig. 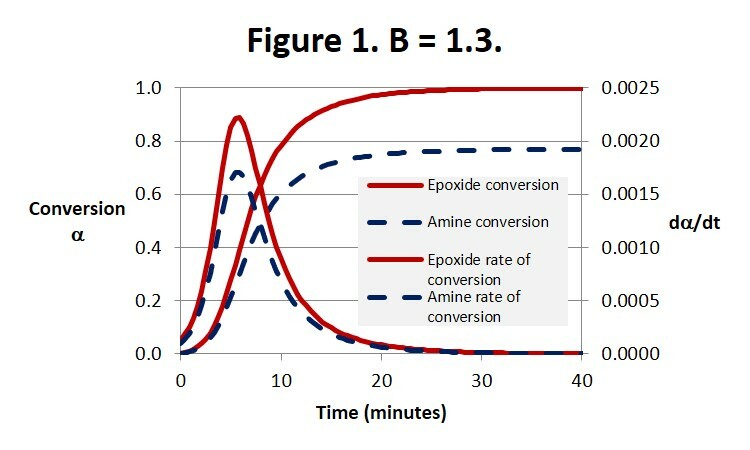 4 that conversion of the epoxide is only complete (αEp = 1) for B = 1.25 (after 25-30 minutes) and the conversion of amine (αAm = 1.0) for B = 0.8 (after 35-40 minutes). As can be observed the order of time to complete or ultimate conversion is excess amine first, excess epoxide second, and 1:1 stoichiometry far behind in third place. The effect on amine conversion is more complex but the order of the time to complete conversion remains the same. We ascribe these differences to the epoxide being the source of the hydroxyl. While interesting we doubt that they are significant. In summary, there are potential benefits from altering the stoichiometry of the amine-epoxy reaction. It is not uncommon for systems to be amine-rich, with for example a 30% excess of amine. This will help ensure that there is no unreacted epoxy that can react with itself at elevated temperatures leading to unwanted increases in Tg, modulus and other physical properties. From Fig. 2 we see that even a small excess of amine will greatly reduce the amount of time needed to reach complete conversion. And Fig. 3 suggests that the intensity of the exotherm may increase as the excess of amine increases. In amine-rich systems the reaction of epoxide will be complete, ie it’s conversion will be equal to 1. However the reaction of amine will be incomplete, and its ultimate conversion will be less than 1. An excess of epoxy could provide a beneficial increase in Tg and related properties in a postcure process if that were desired. A surface rich in either unreacted amine or epoxy could also be useful when building layers, eg in pseudo-isotropic fiber reinforced composites or 3d printed parts. 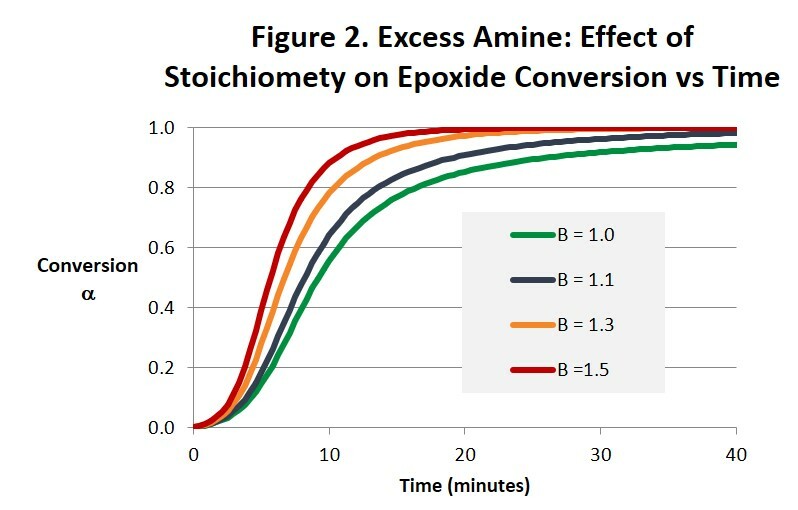 Both the conversion at the gel point and the time to gel will be affected by either excess amine or excess epoxy and need to be considered when formulating epoxy-amine systems . In our next post we shift gears and look at the fitting of cure data to the phenomenological equation below (Eq. 3 in Part 11 of this series).